Heat a large cast-iron or nonstick griddle (you can also use 2 cast-iron or nonstick skillets). Add the oil, bell peppers, onion, garlic, oregano and crushed red pepper and season with salt. Cook over moderate heat, stirring occasionally, until the peppers are softened and just beginning to brown, 6 minutes. Push the vegetables to the back of the griddle, cover with an inverted heatproof bowl and keep warm over low heat; stir occasionally as you cook the sausages. Prick the sausages with a knife and cook over moderate heat, turning occasionally, until no trace of pink remains, 10 minutes. Add the sausages to the vegetables and keep warm. Brush the rolls with oil and toast on the griddle. 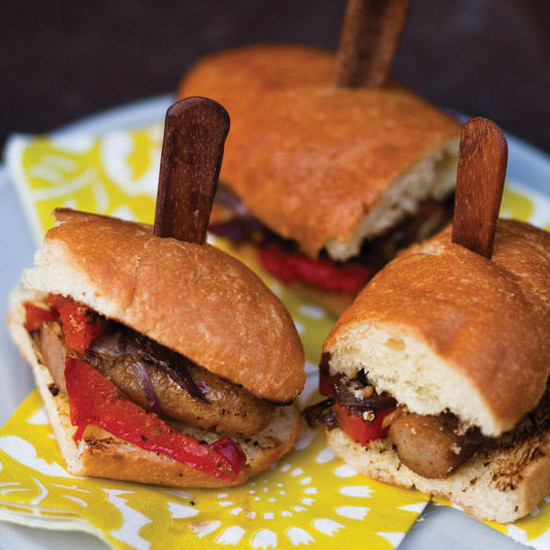 Fill the rolls with the sausages and peppers, cut each one in half and serve.